Mt. Gillion CME Church will have a celebration event on January 26, 2018, at 7:30 p.m. Calling all choir, soloist, and praise dancers. Mt. Gillion CME would like to invite you to their musician Kameron Pleasant, appreciation celebration. The New Hop CME Church is hosting its annual gospel bowl on January 6, 2018, at 3 p.m. Speakers for the event are Bro. Marvin Jackson of Jacob Memorial church of God in Christ, Bro. Larry Williams, of Moss temple church of the living God, Sis. Janice Garrett, of New Prospect Missionary Baptist Church, and Bro. Tyron Garrett of the Triumph Kingdom Church of God in Christ. Evangelist Stephani Byrd, of Bethel Temple Church of God in Christ. Rev. Alva Taylor, of Iron Wheel Baptist Church. Evangelist Pam Suell, of Mt. Gillion Baptist Church. Rev. Lashan Morris Hayter pastor of St. Mark CME Church. Rev. Milton Proctor Presiding Elder. Mt. Olive Missionary Baptist Church located on 4417 CR 4054 in Timpson, TX would like to invite you to the Dedication of Sanctuary Service 4:30 p.m. on Saturday, January 5, 2018. Refreshments will be served following the service. Bennett Chapel Baptist Church will have a Watch Night Service on Monday, Dec. 31, 2018, at 9 p.m. Special music from Chuck and the Guiding Clouds of Huntsville and the Anointed Voices of Shelbyville. St. John Missionary Baptist Church is hosting a Watch Night Service on Monday, Dec. 31, 2018, at 9 p.m. Bring in the New Year with praise and worship. Come worship with them as they bring in 2019! The Timpson Ministerial Alliance will have Watch Night Services on Monday, Dec. 31, 2018, at 10 p.m. at the Clayton Temple Church of God in Christ in Timpson where Elder Marvin Jackson is the pastor. Rev. Carlos Johnson will be in charge of the service. Watch Night Services at the Abundant Love Ministries on Monday, Dec. 31, 2018, at 10 p.m. This coming Sunday, Dec. 30, 2018, the Spring Hill Baptist Church 4 miles south of Martinsville is hosting a community church service at 6 p.m. Churches from all over are invited to come and worship with us. The pastor of Bethlehem Baptist Church of Chireno will bring the message. Watch night service on Dec. 31, 2018, at 9 p.m. at the Bennett Chapel Missionary Baptist Church in Shelbyville. Everyone is invited to attend. The Mt. Zion CME 5th Sunday Missionary Program will be held on Dec. 30, 2018, at 3 p.m. Guest speakers will be First Lady Pearlie Nash of the House of Refuge Ministries and First Lady Lillie Price- Standely of East Liberty Baptist Church. Rev. Richard Edwards, pastor, and Joyce Johnson missionary president. 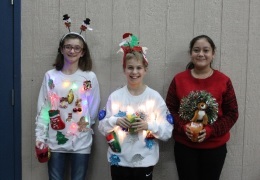 At the monthly 4-H Club meeting in December, youth gathered together their ugly Christmas sweaters of homemade creations and funky store finds. Three winners were crowned: Michelle Gomez won “Best Store Find”; Kassidy Scruggs won the “Most Creative” prize, and Kolton Scruggs took home the “Best Homemade Creation” and overall ugliest sweater. After eating pizza and homemade desserts, the youth formed a big circle to take on the Saran Wrap challenge. Four large Saran Wrap balls were passed around the circle as the kids tried to unwrap them one-handed using a silicone oven mitt. Chaos followed with candy and prizes flying in all directions! Michelle Gomez, summarized the night’s activities with, “Tonight was really fun. I loved seeing how all the kids had fun working together to unwrap the prizes in the Saran Wrap. The Shelby County 4-H Club meets the first Monday of each month at 6:00 p.m. in the Extension gym building at 266 Nacogdoches Street – Center. Our 4-H program includes projects in food and nutrition, photography, robotics, textiles and sewing, livestock/showing, taxidermy, shooting sports, and horse. Youth in grades 3 through 12 are invited to come out to our next club meeting scheduled for Monday, January 7, as we learn about backyard birding and butterflies. We will be making feeders to take home to attract beneficial wildlife and insects. If you have any questions regarding the 4-H program, feel free to contact county agents Jheri-Lynn McSwain or Lane Dunn at 936-598-7744. Sabine County Beekeepers will meet January 7th, 2018, at 6:30 p.m. at Sabine County Chamber of Commerce (125 N. Texas Street on the square in downtown Hemphill). We will start meeting the first Monday of every month to discuss all aspects of beekeeping. If you are interested in finding out what we are all about please stop by. We have no officers and no dues. 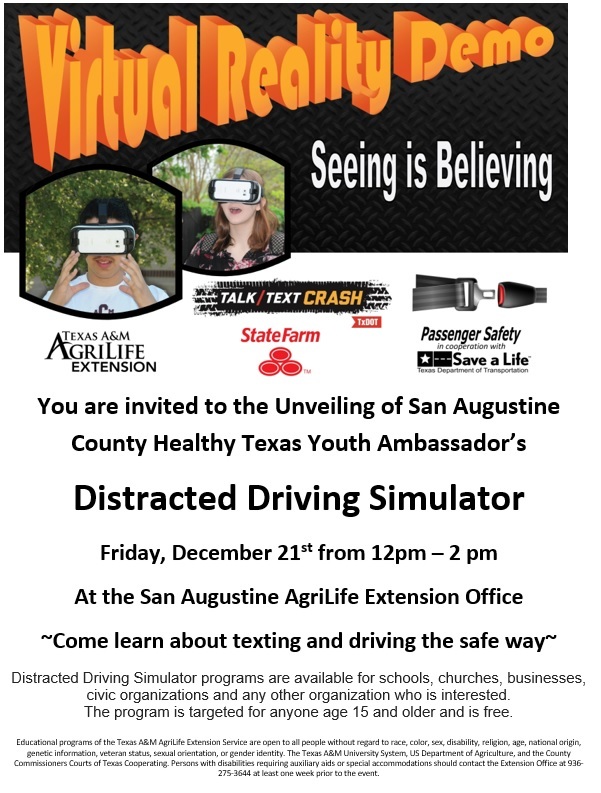 For more info call James 409-625-4787. We will meet the first Monday of every month. Attached is the Final Listing for the Texas A&M AgriLife SACMG Membership giving 2019 the Officers/Membership/and Contact Information. 2018 was a very successful year with lots rewarding projects and we are all looking forward to the new year's activities. With our newly Certified Master Gardeners, there are a number of changes in membership, officers along with corrections to spelling, phone, email, & address information that differs from the old 2018 List. **Also, All you Master Gardeners, Please turn in your July through December Volunteer Hours form for our DETCOG credits. Please send or drop the sheets off to Kim Fountain by next Friday so they will be available for Erin Hollis to pickup and compile. You never know who will come visit you at this time of the year. Be sure to be good so the one you want to visit will do so! If I don't see you before then, have a safe and enjoyable Holiday Season! The Joaquin Band Program and myself would like to invite the district and community to come out this Thursday, the 20th, 6:00 pm to hear some sounds of the season as we present our annual Christmas Concert in the JHS Gymnasium! The concert will include performances from both our 6th Grade Beginner band and our 7th-12th grade JH/HS composite band. Please consider coming out and supporting our students. The Mt. Zion Christmas Musical will be held on Sunday, December 23rd, 2018 at 3 p.m. Please join us as we celebrate the birth of the Messiah in song and Dance. Our Christmas Eve Service, like all of our services, is open, inviting and welcome to all. St. John’s Episcopal Church is located on 1063 Southview Circle. May the timeless message of Christmas fill your heart and home with joy now and throughout the coming year. Center, Texas – December 14, 2018 – A longtime Christmas tradition continues at the First United Methodist Church (UMC) of Center as the church’s Chancel Choir presents its annual Christmas Cantata. Rev. Karen Jones extends the invitation for everyone to attend the cantata on Sunday, December 16 beginning at 10:00 a.m. at Center First UMC located at 211 Porter Street. The First UMC Chancel Choir will perform this year’s cantata titled “Sing a Song of Christmas” written by composers Michael Barrett and Joseph M. Martin offering traditional carols in a jubilant mix and musical variety ranging from galloping gospels, to contemporary ballads and joyful carols to tender manger lullabies. Under the direction of Chris Watlington, First UMC Music Director, the cantata will include the church hand bells ensemble and local musicians accompanied by a video developed by Watlington with the assistance of church members sharing the Christmas story. The Tri-County Harvest for Homes Produce drop scheduled for Dec. 26, 2018, has been canceled. The New Harmony First Pentecostal Church will have their Family and Friends Day Program on Saturday, Dec. 8, 2018. 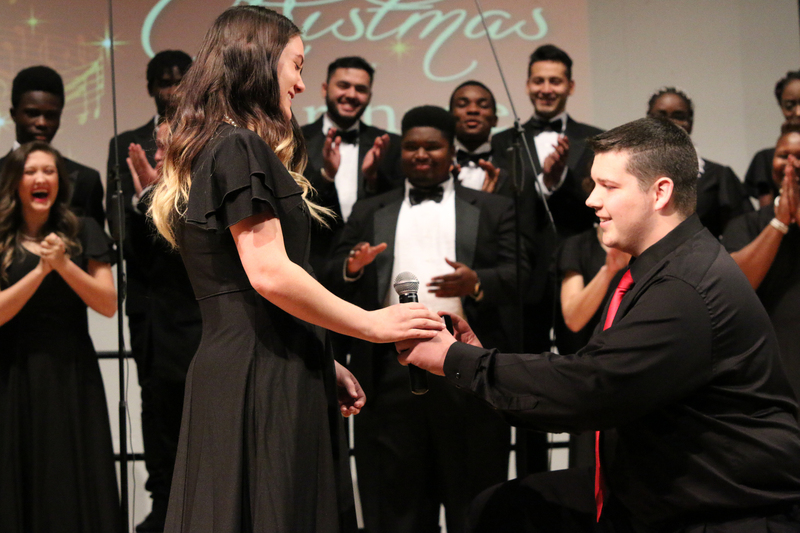 There were singers and dancers and musicians playing, but the highlight of the 2018 Christmas in Carthage was an unexpected “Love, Actually” moment when band member Colby Taylor walked on the stage, took the hand of choir member Maggie Sims, and proposed to her. She said, “Yes,” much to the delight of the audience. Christmas in Carthage was held this year on Tuesday, Dec. 4, at the Carthage Civic Center. The event is a local tradition, started by the late Larry Brumley, who conceived of the idea as a way for Panola County to usher in the holiday season, explained Dwaine Hubbard, master of ceremonies and instrumental music professor at Panola College. 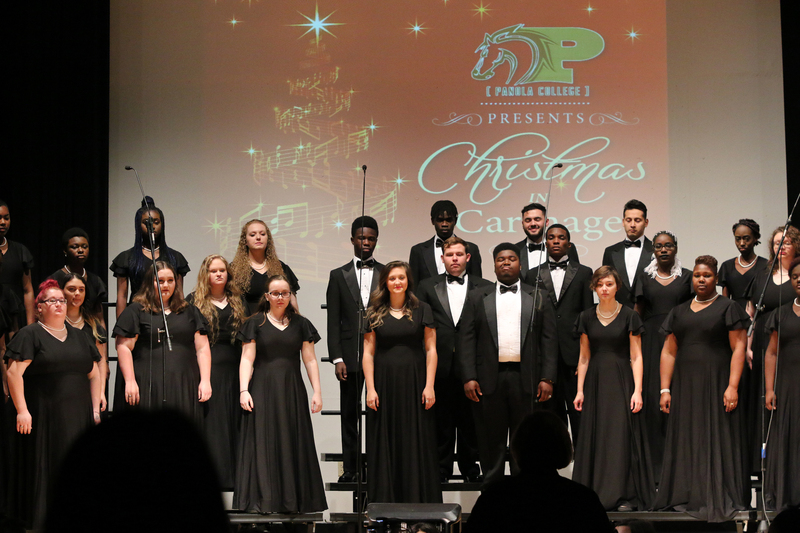 This year’s program included performances by the Panola College Choir and Panola Pipers, under the direction of Sandra Bauer, vocal music professor, along with the Concert Band and Jazz Band. In addition, dancers from the Carthage High School Bulldog Belles, Rowe Performing Arts, and singers from the Gary ISD Junior High School Choir performed. Bulldog Belles included Savanna Gwinn, Shelby Walters, Emily Pyle, Constance Barber, Taylor Barton and Mary Kathryn Smith. Students performing included from Rowe Performing Arts: Constance Barber, Brooke Cabello, Molly Windham, Madison Dunn, Ainsley Piedra, Jeriona Williams, Sh’Jerian Williams and Addison Pope. Gary ISD Junior High singers, directed by their teacher Kristy Cawthon, were Bailee Lilly, Abi Kate Cawthon, Aubrey Kennedy, Katrina Pugh, Alyssa Thompson, Samantha Griffith, Jordan Brown and Michael Duron. Panola College singers are Susan Adewale, Ronke Ajoniloju, Toluwani Ayodele, Boluwatife Babalola, Samiat Fashola, Charles Felix, Latifat Opeodu, and Ademola Sanni, all of Nigeria; Funminihi Alabi, Loma Linda, CA; Loren Caserta, Beckville; Victor Chinaka, Dallas; Kaitlyn Cox, Hallsville; Afrikina Dotson, Center; Lucy Eke, Carthage; Latiffannie Gardner, Center; Michaela Garrett, Center; Joel Martinez Gonzalez, Tenaha; Jamya Gossett, Nacogdoches; Emma Harden, Tyler; Joy Jekayinoluwa, Arlington; Kacia Johnson, Tatum; Abigail Joseph, Kenya; Carrie Lilly, New Caney; Destiney Miller, Ore City; Makayla Miller, Ore City; Hunter Moon, Beckville; Pamela Nichole Painter, Marshall; Whitney Ramsey, Center; Mia Sartor, Carthage; Maggie Sims, Center; Kailey Stephens, Carthage; Sydnee Taylor, Carthage; Aaron Tello, Center, and Jaren Whitton, Etoile. Panola College band members include on flute: Ma’Kayla Campbell, Henderson; Madison Cichoracki, Tatum; Jessica Coats, Henderson; Maricruz Gonzalez, Center; Savana Hanaway, Carthage; and Perla Mateos, Center. On clarinet: Chelsea Ener, Hemphill; Kirsten Mayfield, Garrison; Destiney Miller, Ore City; Emily Ortiz, Carlisle; Samantha Stilley, Hallsville. On bass clarinet: Lucero Luna of Tatum. On contra-alto clarinet: Megan Gilley, Hallsville. On bassoon: Whitney Ramsey, Center; on saxophone: Kassi Orbaugh, Carthage; Elijah Johnson, Shelbyville; Selena Mendoza, Tenaha; Alex Rodriguez, Tenaha; and Lydia Woods, Beckville. On tenor saxophone: James Lilly, Jasper; and Whitney Ramsey, Center. On baritone saxophone, Somali Fletcher, Hallsville. On trumpet: Sarah Allen, Henderson; Kaleb Baker, Carthage; America Cabriales, San Augustine; Ruben Hernandez, Tenaha; Miguel Mendoza, Tenaha; Makayla Miller, Ore City; Mahiko Moreno-Flores, Nacogdoches; Brandon Renteria, Tenaha; Maggie Sims, Center; and Josh Wood, Carthage. On French horn: Sarah Allen, Henderson; Mauricio Alejaldre, Center; Dakota Brown, Marshall; Erica Lee, Center; Jose Torres, Center, and Maddox Whitaker, Hallsville. On trombone: Dakota Brown, Marshall; Jaime Gonzalez, Carthage; Hernan Hernandez, Center; Tressie Key, Henderson, and Eder Nunez, Center. On bass trombone: Carrie Lilly, New Caney, and Steven Sierra, Hallsville. On baritone: Colby Taylor, Carthage; Jessye Massey, Shelbyville; Makayla Bell, Garrison; Demetrius Cooper, Carthage, and Andres Leon, Center. On tuba: Martravian Williams, Tenaha; A.J. Bowers, Carthage; Steven Sierra, Hallsville, and Daniel Quetzala, Garrison. On percussion: Nicklaus Powell, Shelbyville; Itzel Farias, Garrison; Moses Sangowoye, Lagos, Nigeria; Godwin Adewale, Lagos, Nigeria; and Crystal Whitehead, Marshall. On piano: Carrie Lilly, New Caney. Sponsors for 2018 Christmas in Carthage were First State Bank & Trust Co.; First United Methodist Church; Bauer Furniture; Central Baptist Church; KGAS Radio; Pippen Motor Co.; State Farm Insurance, Tate Barber and Patsy Meck, local agents; Kay and Dwaine Hubbard; Sarah and Mike Isbell; the Panola College Foundation, and Complete Printing & Publishing. Dec. 7, 2018, is the last day to turn in your "Letter from Santa" Order Forms! Time has flown by, but tomorrow is the deadline. Parents have been sending their forms in quick and Santa already has lots of letters to write! Be sure to get your order form in before it's too late. The letters are $10 per child. 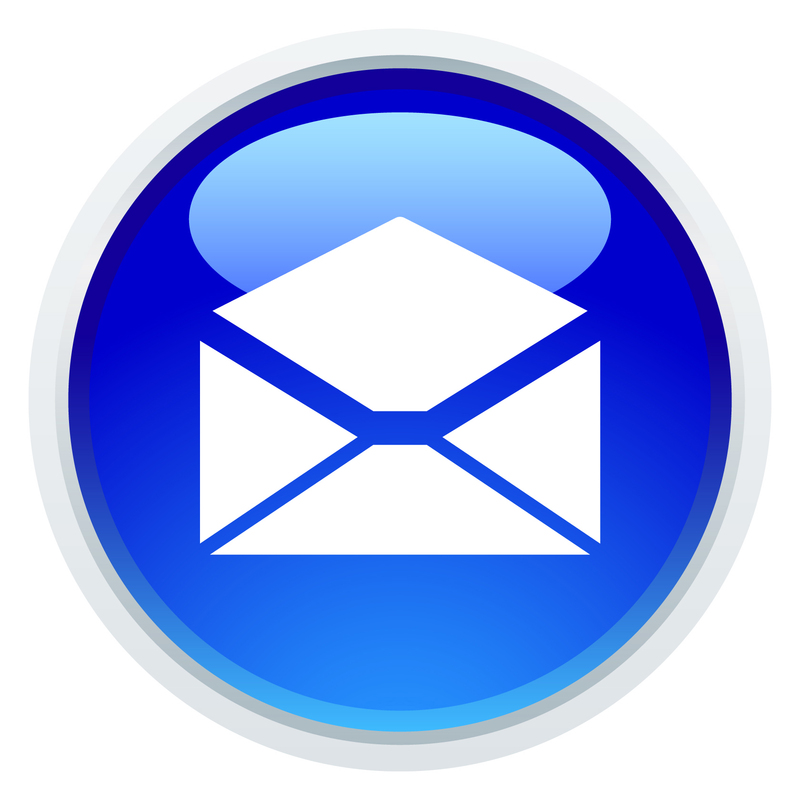 Your child will receive a personal letter from Santa Claus along with an ornament to hang on the tree. This ornament will remind them of what the real reason for the season is and the excitement of this moment. Santa will address the letter to your child to make their Christmas season extra special! 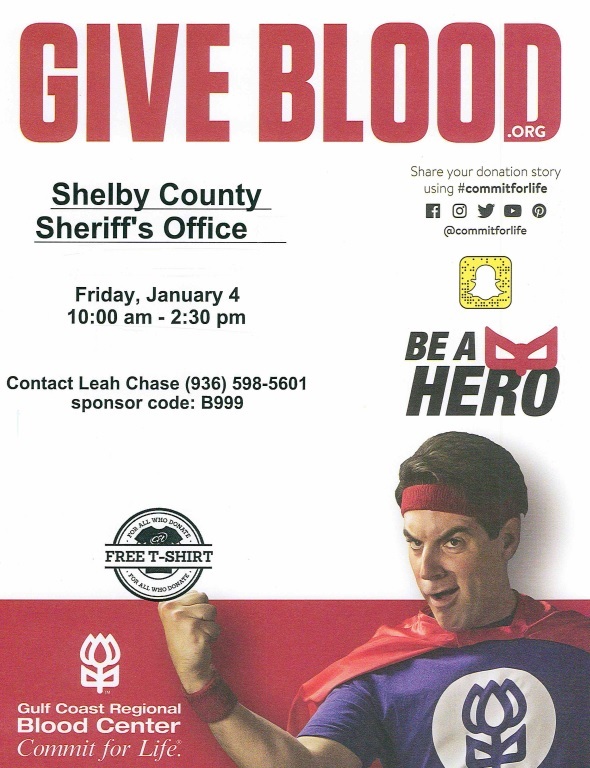 Here are the ways you can get a "Letter from Santa" Order Form: Pick one up from Shelby County Outreach Ministries, Inc. by asking for Josh. You can check our Facebook pages and print one out from there and turn them into the Outreach. Shelbyville Elementary school is also helping us with this fundraiser, so, if your child attends that school, turn all order forms into the front office by Friday, Dec. 7, 2018. For questions or more information, please call us at 936-598-4990. Just ask for Josh. Thank you and may you all have a Blessed and Merry Christmas. The Shelby County Outreach Ministries bake sale fundraiser has been rescheduled due to the weather. They will have it next Friday, Dec. 14, 2018, at the Napa parking lot on Hurst Street in Center. The Nacogdoches County Chamber of Commerce is offering health insurance product options designed to give businesses that employ between 2 to 50 employees a group insurance advantage. Small business owners have two meeting times to choose from to gather information: 10 a.m. and 2 p.m. on Thursday, Dec. 6. "We are excited about this new member benefit" said C. Wayne Mitchell, President & CEO of the Chamber. "Finding a better health insurance option for our small businesses has been a priority for the Chamber. We are confident that in many cases this new product will give businesses lower premiums and better coverage." The 23rd Annual Miss Merry Christmas and Mister Happy Holidays Pageant was held December 1 in Center. This years pageant was a very special pageant with all proceeds going towards a Roughrider Scholarship in Memory of Tonya Bailey. Mayor David Chadwick opened with a special prayer for the day. Making Cookies with Santa Come to Sassy Red's for pictures with Santa and cookie decorating!! FREE!! Picture set will be Santa with a mixer, rolling pin, flour, cookie cutters, etc. Cookie decorating will be available when you come in before or after having your picture with Santa. Shelby County Outreach Ministries, Inc. wants to remind you about our Letter from Santa fundraiser, which is happening right now! This is the last week before Santa mails out letters! What better gift for a child than to know that Santa took the time to mail a letter to them?! Can you remember how important you felt when, as a child, you received a letter with your own name on it? Let your child feel that same excitement and magic! Santa will not only send them a personal letter, but he will also send a Christmas tree Ornament to commemorate the special moment. Order forms must be turned in by December 7th, 2018. Come by the Outreach to get your order form before it's too late! For questions, call 598-4990. Thanks and God Bless you. On Saturday, December 15, park staff will offer a hands-on presentation that will explore the process of designing maps during the Civil War. The program starts at 2 pm and will be held in the museum theater. Examples will be given of period maps and the methods involved, revealing the subject of mapping as both a science and an art. Other tools of the trade, such as compasses, will be examined and discussed, comparing these instruments with the aids we use today for mapping. For those who wish, especially the kids, there will be an opportunity to draw your own map with paper and pencils provided by the site. This will be both a fun and educational presentation on a unique topic we still use today. Mansfield State Historic Site is located on LA Highway 175, three miles south of the town of Mansfield, Louisiana. Admission is $4 per person ages 4-61; seniors 62 and over and children 3 and under are admitted free. For more information call 318.872.1474 locally or 888.677.6267 toll free, or visit www.LaStateParks.com. Strong Triumph Church, under the leadership of Elder Faye Dell Allen, cordially invites everyone to join in with us as we celebrate the reason for the season and share His love with our family and friends in our annual Christmas celebration. The celebration will take place Saturday, December 15, 2018, at 7 p.m. Speaker for this spectacular celebration will be newly elected shepherd, Rev. Charles McCowin of Triumph the Church and Kingdom of God in Christ of Houston, Texas. We invite all choirs, soloists, and praise dancers to join in the celebration. For more information, please call Elder Faye Dell Allen at 936-368-2611 or 936-572-5810. The Timpson Area Genealogical and Heritage Society will celebrate its Christmas Party at 11 a.m. on Wednesday, December 12, 2018 at Timpson First United Methodist Church on 311 Austin Street near downtown Timpson (75975). 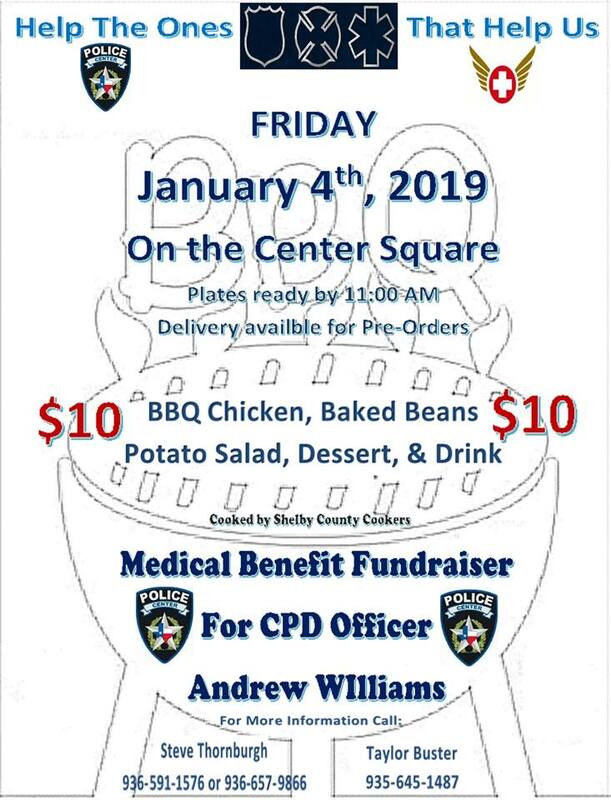 The party will be a potluck affair with members and guests bringing dishes, and the new officers for 2019 will be installed. For more information, please contact Dickie Dixon at (936) 240-8378 or dickie.dixon@hotmail.com Interested parties can also call the Genealogy Room at Timpson Public Library at (936) 254-2966.